Josh Withers has received notoriety among the Cafe Racer community with two recent award winning cafe motorcycle concepts based off of 1970’s era BMW motorcycles. His motorcycle restorations have been commissioned from Los Angeles to Moncao and been featured in a variety of magazines and all over the internet. This is a site to document, share information and other general musings about 60’s-80’s BMW motorcycles, a 1972 BMW 2002 car and other random fun. Hey, you know quite a bit more than i. I have r90/6 and i’m looking to replace the bent handlebars. I was hoping to do it on the cheap using a 7/8 inch instead of the pricey 22mm milled handlebars available for a factory fit. I understand that with a little bit of dremel and some filing that its possible to do a D.I.Y. fit with 7/8 Do you know some of the challanges that i will have as in what needs to be filed and fit and how safe and effective the whole process is. any ideas or suggestions. Do you know if the RD 400 is still for sale. If so how much? A friend picked up the RD for $300 or $400. I think he bought a new top end for it and put a wee bit of work into it… and last time we talked about it (a few months ago) he said he would sell it for $800 (his costs so far). If you are still interested, let me know and i can put you in touch. Just noticed you have a manual for the M65 Aermacchi. I’m trying to track down the oil specs and volumes. Does the manual indicate what oils are used in what parts of the engine/trans? I will send you a PDF of it on Monday or Tuesday. Where is it written that the knee pads have to be on the bike? 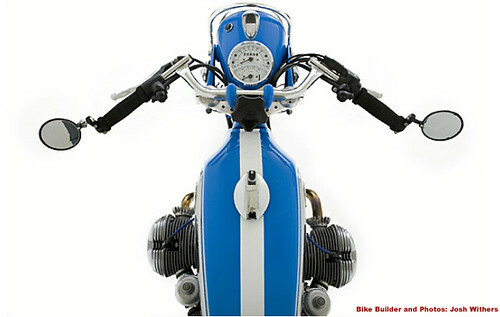 Sort of odd from someone building a ‘custom’ R75 to the chagrin of a many a purist. Better manual? Yes, color wiring and some tweaks here and there. So if one were to photograph a cover and say it had a Brown’s sidetand or a Corbin seat on it, then we need a ‘disclaimer’ on it: “hey BMW never had a /5 that looked like this”? Well, if you did, I would add a section in the book that explains a Brown’s sidestand and how to install it. Then you could also add a section on the various types of electronic ignitions. I, for one, would LOVE a BMW book that illustrates the knowledge (installation, benefits and possible drawbacks) of the various aftermarket ‘improvements’ and upgrades available for these 40 year old machines. I use the Clymer’s manual for BMW specific procedures but that is only half of my reference materials. The rest comes from manufacture instructions, Duane Ausherman’s site, forums like Boxerworks, trial and error, etc.. I happen to work in the professional advertising photo industry and usually when something isn’t ‘product correct’ it does have to get a disclaimer. So we have a whole team of people who analyze car photos and CG car illustrations (most car ads are actually not photographs. They are CG art.) and make sure everything is accurate. Hi there, I’m also starting a BMW cafe project, thanks for the inspiration! I’m looking for inexpensive chrome side panels from a toaster tank (in any condition really, some rust or broken tabs is fine, just getting started), if you come across any, let me know. Hey Craig, you are the second person to ask about some side panels lately. I’m going to inventory my collection of panels next week and get back to you. I have a few off getting re-chromed now. Inexpensive might be tricky though… unless you don’t mind dented and dinged. New to the list here. About 14 years ago while on the road to Gainsville, Fla. I picked up what is jokingly referred to as my “Florida Geezer Bike.” The bike was a mess, I could use up too much space detailing what the DPO had done. It is time to give the old girl a ground up restoration. I enjoyed reading the fork modification tech and center stand posts. I have torn down the /5 and plan a mild hop up resurrection. The cosmetics will be pretty straight forward. My first toaster was a blue SWB. I’d like to tighten up the handling, can I convert this to a Geezer to a SWB by using a SWB swing arm, if so do I have to use the rear drive as well? It seems to me I remember reading about that there are different final drive ratios. Does anyone on the list know how to fabricate the diagonal frame brace, that I’ve seen on a few Vintage race bikes? I’m guessing that there might be some mild frame flex under hard use on the track. You can convert any bike from the 70’s to a SWB. Many will criticize you for doing so because the handling is supposed to improve on a LWB. You will have to get a SWB swingarm, driveshaft, subframe, brake arm and seat. Your old final drive will work. There are different ratios that came on different bikes but the /5 SWB and LWB is the same (i think). I have a set of those diagonal frame braces that i am considering selling… you can find them out there. I believe that you are likely single handedly responsible for a resurgence of these fine machines running on the roads today. You tastefully scrub off the “stodginess” perceived by so many people when it comes to the old airheads and expose their true souls… light, powerful and very dependable road companions. Thanks for your efforts, both in the shop and on this blog!